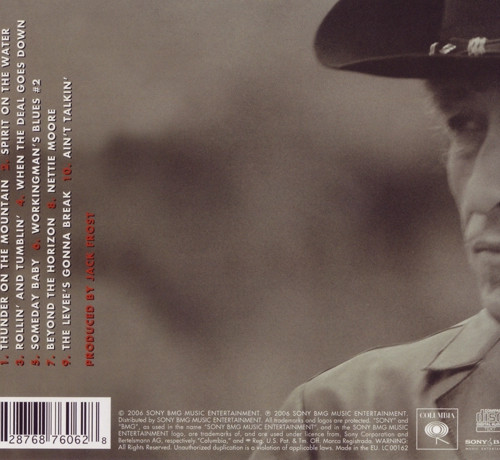 Five years after the delicious, Americana-influenced "Love And Theft", Bob Dylan gave us pretty much more of the same with this uplifting, often exhilarating album, which had a real ad hoc, almost live feel to it. His band were on top form and they just got on with it, or it certainly seemed like it, listening to its loose, ready groove. Apparently, several lines in some of the songs were ones that had appeared earlier in old blues songs, sparking a bit of controversy. You know what? I don't care. I didn't care when Led Zeppelin did it and I don't care when Dylan does it. He is influenced by these songs so he goes somewhat jackdaw-like when writing new ones. I guess he should have credited the original writers of those lines, but I'm not going to lose any sleep over it. Dylan loves Americana and he uses it wherever he can to enhance his songs. That is what he is all about in this later phase of his career. The whole album has hints of songs and artists all over it. "Thunder On The Mountain" is a lively, appealing bluesy rocker with a namecheck for Alicia Keys, who Dylan was thinking about, apparently. There is some excellent rocking blues guitar on the track and just a great vibe to it. It just gets you going. "Spirit On The Water" sounds like it is straight off "Love And Theft", with that laid-back, swampy, jazzy guitar and shuffling, appealing beat. Dylan softly croaks away and it just sounds so reassuring and comforting, even. "Rollin' And Tumblin'" is an upbeat, Muddy Waters-influenced rocking blues of the style we have come to expect from Dylan now, particularly since "Time Out Of Mind". I really like these later-era Dylan albums - they are invigorating, enthusiastically played and just most enjoyable. "When The Deal Goes Down" is a slow, yearning song with Dylan actually crooning, a style he would come to utilise in later years when he covered that sort of material. This is more a piece of old time, bluesy slow swinging jazz. "Someday Baby" recycles that old six note blues riff that Dylan and many, many other artists have used before - Muddy Waters, Sleepy John Estes (originally) and The Allman Brothers Band, to name just a few. 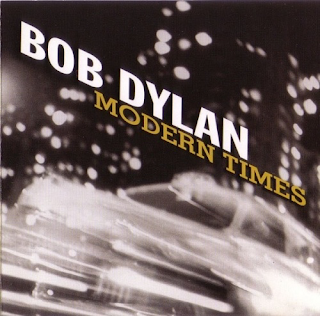 Now, the mighty "Workingman's Blues" is up there in my top ten Dylan songs of all times - it is a slow-burning, sad-sounding song, jam-packed with great lines and Dylan's voice just makes me feel tearful when I hear it on this song. I can't express just how much I love it. "Sleep is like a temporary death..." is just one of the lines that really does it for me. "Beyond The Horizon" is another old-time crooning, shuffling jazzy slowie with some lovely jazz guitar at the end. "Nettie Moore" is a re-working of an old nineteenth-century folk ballad. It is performed here over a thumping, funereal drum backing as Dylan's grizzled old voice delivers the tale of his devotion to Nettie Moore despite his struggle and strife. A sombre violin backs him as he launches into the growled chorus. "The world has gone berserk - too much paperwork..." he tells us. Indeed. "The Levee's Gonna Break" is a lively blues romp with some killer rockabilly guitar, throbbing bass and Dylan on enthusiastic vocal form. Finally, "Ain't Talkin'" is a solemn, extended number to end upon. It is reflective, thoughtful and dignified. As with all the post-"Time Out Of Mind" albums, this has been an impressive outing.